Matua means “lead of the family” in Moari. Bill and Ross Spence were sons of a winemaking father. Ross trained in California, Bill in New Zealand. They began modestly in a tin shed in West Auckland in 1974. Success came quickly and by 1976 a partnership had formed with another Auckland family, the Margans. Located in the Waimaku Valley, 30 minutes from Auckland in the North Island. When the Margan family decided to depart, Matua Valley partnered with the Australian company, Fosters and its wine division, Beringer Blass. 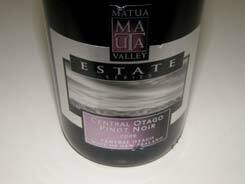 This winery produces varieties sourced from estates throughout New Zealand as well as their own vineyards in Waikoukou Valley near Auckland. Visitors are welcomed at Cellar Doors in Auckland and Marlborough. Imported to the United States by FWE Imports, Napa, CA.